The land of Peru can be divided into three natural areas: the coastal region; the mountains; and the forests. All these areas have different species of fauna and flora, making it a country with a rich and varied biodiversity, and the home of species sought by collectors throughout the world. With illicit trafficking being one of the biggest threats facing Peru’s wildlife resources, exports of wildlife and wildlife products has become a focus of attention for Peru Customs (SUNAT). This article introduces the Customs administration’s efforts to counter the illegal wildlife trade. Article 68 of the Peruvian Constitution stipulates that the State is obligated to promote the conservation of biological diversity and protected natural areas, while Article 364 (f) of the ‘law on the regulation of forestry and wild fauna’ states that the hunting, capture, collection, possession, transportation, marketing or export of specimens of wild fauna without the corresponding authorization constitutes an infringement of the respective legislation. The internal transportation, trading and/or export of specimens of wild fauna, therefore, requires appropriate documentation, whether a licence to transport wild fauna or, for species protected by the Convention on International Trade in Endangered Species of Wild Flora and Fauna (CITES), a CITES permit or certificate. Ministry of Production and Foreign Trade (PRODUCE) manages aquatic flora, marine, and continental hydrobiological species included in appendices I, II and III of the CITES Convention. Traffickers trading wildlife illegally use third-party and/or fraudulent permits to trade controlled species. This involves a variety of players in a system that begins with communities close to wildlife, and extends right through to intermediaries and collectors. The trafficking of wildlife, which includes live or dead animals, plants, and readily recognizable parts or derivatives of them, is a lucrative business. Transport costs are low, and there are no concerns over decent wages or these potentially damaging environmental practices. According to SERFOR, it is the third most important business in the world after the illicit trade in drugs and weapons. It is also a heinous and potentially lethal trade. Experts from the WWF, the nature conservation group, have calculated that between 60% and 80% of all live animals targeted by smugglers die during their capture, transportation or subsequent trading. Moreover, the fact that an animal is seized does not guarantee that it will survive. Using appropriate handling methods during seizures – the period of time from the seizure to the transfer of an animal to an authorized establishment – is critical, as it might contribute, among other factors, to the survival of a species. Traffickers overexploit authorized species or focus on endangered and rare species, which directly threatens the country’s biodiversity. The Government of Peru estimates that 400 species of fauna and flora are in danger of extinction. In addition, illegal trade generates unfair competition, to the detriment of legal traders who comply with the rules. During the 12th Meeting of the National Contact Points of the WCO Regional Intelligence Liaison Office (RILO) for South America, the United States (US) proposed the setting up of an international enforcement operation targeting illegal wildlife trade, and encouraged Members from South and North America, as well as Europe, to participate. The proposal was fully supported and the operation, code-named FLYAWAY, was run from February to July 2015 with 14 Customs administrations participating, i.e. Brazil, Chile, Colombia, Peru, Mexico, Uruguay, Venezuela and the US, as well as Germany, the Netherlands, Portugal, Spain, Switzerland and the United Kingdom. It was divided into three stages: pre-operative; operative; and post-operative, with national controls being intensified in the operative stage, which ran from 17 to 26 June. Countries exchanged information on seizures made, as well as on risk indicators. They also alerted each other when a suspicious shipment had left the country of origin without being controlled – Peru, for example, alerted US Customs and Border Protection officers that a shipment of 170 birds destined for Kuwait, and potentially in breach of wildlife laws or treaties, was coming their way. In this regard, they suggested that a wildlife specialist be present while the species was being checked in the US against the accompanying documents. The US authorities did not allow the transit of the shipment as the species was protected under the US Migration Bird Act, and sent the shipment back to Peru. As the export operation was done in compliance with Peru’s national standards, Peru Customs did not proceed to seize the birds. At the national level, Peru Customs took up contact with the Public Prosecution Service Specialized in the Environment (FEMA), the National Police Force’s (PNP) environmental division, OSINFOR, PRODUCE, and SERFOR to generate intelligence in order to build a database of indicators that would allow risky destinations, recipients and forwarders of wildlife shipments to be monitored. The participation of OSINFOR, PRODUCE and SERFOR was essential to ensure that controlled products were covered by a title document that had been verified or checked, and found to be in conformity with national legislation. In coordination with these government agencies, Peru Customs carried out operations in primary areas, such as airports, land terminals and border control posts, and in secondary areas, such as highways and at specific establishments. These interventions led to 35 documented findings of wildlife at the national level, 32 of which resulted from the intensification of controls at various national control points (primary areas), while three finds took place thanks to joint operations with different state bodies such as SERFOR, the PNP and FEMA (secondary areas). In addition, various national joint operations were carried out that did not record any positive finds. Exports of quantities greater than those authorized. Declaration of an entity code different from the administrative authority or the omission of such information from the Peruvian Customs declaration (DAM). 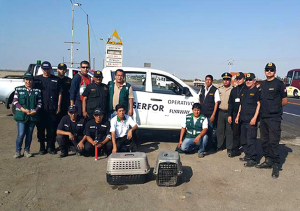 In Peru, the operation revealed Customs clearance officers’ lack of awareness of the technical identification characteristics of species protected by the CITES, and confirmed the necessity of establishing strong communication mechanisms with other institutions. It also highlighted a critical issue related to the DAM: the declaration does not require the exporter to indicate the scientific name of the species to be exported, making it harder for an officer to determine whether the species reported in the document is protected under the CITES or not. Operation FLYAWAY also addressed an issue that applies to the international wildlife trade as a whole. In many countries, a ‘stamp’ on an official document is not a sufficient guarantee of genuine legality. In such an environment, the challenge facing Customs controls can be met only if all government monitoring and control bodies cooperate with each other. Without this cooperation, the sustainability of threatened species, a product of indiscriminate trading, cannot be guaranteed. Peruvian Customs, for its part, intends to reinforce its links with SERFOR and PRODUCE. An inter-institutional agreement is recommended, as are training courses and a mechanism for officials to exchange information on CITES protected species of fauna and flora. Too often, especially in the case of enhancing and reinforcing skills, activities are carried out unilaterally, preventing feedback and the exchange of ideas, and also hindering the unification and standardization of policy. Such an inter-institutional agreement already exists between SUNAT and MINAGRI. Both bodies help to improve efficiency in the fulfilment of their inter-institutional objectives by carrying out operations, exchanging information, and carrying out joint operations, including training. With SERFOR falling under MINAGRI, one would think that there is no need for an additional cooperation agreement. However, Customs believes that it would help to boost collaboration in the domain of training and the exchange of information. Last but not least, the weaknesses identified in Peruvian national legislation must also be assessed in detail. Any new national legislative framework must, in particular, establish enhanced control measures, and must ensure that the import and/or export declaration includes the scientific name of the species being traded, something that is not adequately covered by the current legislative framework.